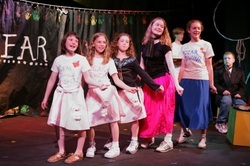 Thirteen year-old Edwina Spoonapple would do just about anything to be a part of the Kalamazoo Advice-a-palooza Festival. While her siblings both have proof “up on the fridge” of their accomplishments, poor Edwina has nothing. When a talent scout from the convention visits her hometown of Paw Paw, Michigan, she trots out her musical advice giving shows live from the family garage in hopes of finding her place in the spotlight. She is assisted by her older siblings (on piano and drums) and a host of quirky friends and neighbors: Becky, the perky cheerleader; Kelli, the cool, sophisticated ballerina; Annie, the girl-scout cookie-selling champion; the Vanderploonk triplets; Bobby, the befuddled new kid on the block; and Scott, who is helplessly and hopelessly in love with Edwina. Together they set out to tackle the world’s problems, in number after hysterical number about everything from birthday party etiquette to the proper way to set a table (“salad fork, fork, plate, knife, spoon”). This beguiling one-act charmer can be played anywhere, with extremely modest sets and costumes. Sweet, smart and tuneful, it appeals to audiences of all ages, as Edwina doles out advice, and finally learns to listen to some of it herself. 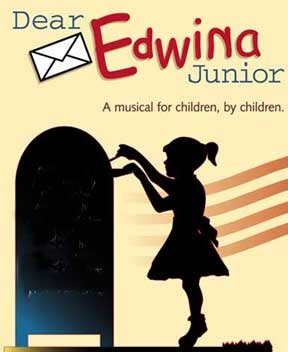 Dear Edwina Junior is the perfect girl-power musical offering many great roles for female performers. 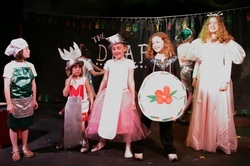 Follow Edwina Spoonapple and her troupe of performers as they present their "advice-a-palooza festival" and learn along the way that taking your own advice may be the best advice of all! At last a musical that features a cast of nearly all girl performers! 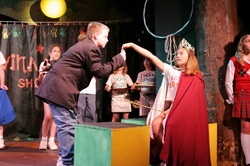 Follow the adventures of advice-giver extraordinaire, Edwina Spoonapple as she directs the kids in the neighborhood in production number after hilarious production number in her "Advice-A-Palooza" extravaganza. Written in the style of Schoolhouse Rock Live! 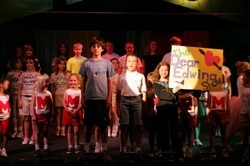 and You're A Good Man Charlie Brown, Dear Edwina Junior is the perfect girl power musical for a new generation.